Most of what I learned about self-sufficiency was done while I was hanging around my mom, aunts and uncles. My grandmother was one of thirteen children. My mother had ten brothers and sisters. I have 4 sisters and three brothers. It’s a large family, but it’s a close family. We have always spent lots of time together. As a kid, much of it was spent gathering, gleaning, cooking and eating. I didn’t realize I was learning self-sufficiency, I just knew that if I wanted to be in the kitchen I needed to make myself useful. The earliest lesson that I remember happened while my mom and her sisters were canning concord grapes. My uncle had a neighbor with an overabundance of grapes. My mom had teenage brothers who needed something to do on a Saturday afternoon. So she sent dad with the boys off to pick the grapes while the women got ready to make jelly and jams. Since I was only 8 years old and my sister was 11, our job was washing the jars. There were dozens of jars that had been brought up from the cellar. We worked in a back room of the house with two tubs. She washed and I rinsed. It was also the job for both of us to feel the top edge of the jars to make sure there weren’t any nicks or cracks that would prevent the canning lids from sealing. Once the jars passed our inspection, they were taken into the kitchen where they were boiled to sterilize them and filled by the adults. It may seem like a lot of work for an 8 year old, but I still check my canning jars this way because of the lesson I have always remembered. Getting kids involved early is key to teaching life long lessons. Kids are naturally curious about what the grownups are doing. Kids WANT to be included in grownup activities. There are oodles of ways to bring your kids along on the road to self sufficiency. It’s never too early. 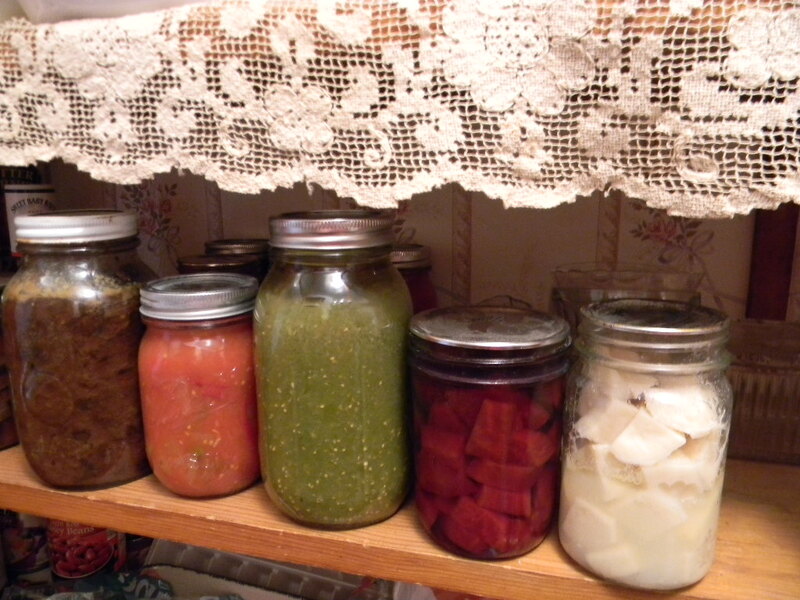 If your kids are the kind who enjoy water, set them up washing jars to prepare for canning. Let them help wash the dog or the car. It may end up in a water fight, but those are great fun in the summer! If they like making mud pies, teach them that making bread or pie crust dough is similar, and let them try it out. Even a preschooler can help roll cookie balls (and unlike PlayDoh, you can bake and eat the results). If they like picking flowers, give them a small plot or row of their own in your garden and let them take responsibility for the tending, watering and weeding. If your kids who are the kind that like to read and figure out things, introduce them to recipe books and let them choose what is going to be made for supper. It will help them practice reading as well as teach valuable math and science skills. Do you have an animal lover at your house? Let them take charge of the pet care and update you on the health of the critters – keeping records like the veterinarian. When you include kids in your activities, at their skill level and with ample encouragement, you are opening up a whole new way of communicating with your child. They learn that adults sometimes make mistakes or have failures and have to figure things out differently. You are creating an environment where your kids can try, succeed (or learn that failure isn’t fatal) and grow. Is there any greater feeling than “real” accomplishment? I don’t think so! If you have stories about your self-sufficiency lessons or any questions, please share them by adding your comment to this post or contacting John at John@JohnMuellerBooks.com.